Born in Bureå, Sweden. His parents emigrated to the US in 1928 and settled in Bridgeport, Connecticut where he attended elementary, junior high, and high school with the exception of a year and a half in Sweden in 1939. He was inducted into the US Army in 1943 and served in the European Theatre as a demolition expert with the 809th Tank Destroyer Battalion from 1945 to 1946. He joined the General Electric (GE) Company in 1946 as a junior draftsman in the "appearance design" operation in Bridgeport with Raymond Patten as director. He left GE in 1948 to attend Pratt Instutute, returning to GE during summer periods, and graduated from Pratt in 1950 with a certificate in industrial design. In 1974 he received a bachelor's in industrial design from the University of Bridgeport. In 1950 he returned to GE where he remained until 1984. 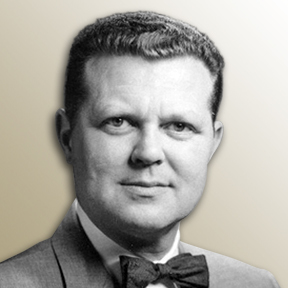 From 1960 to 1984, he was manager of industrial design, GE Housewares Products, where he managed a staff of 20 industrial designers and prototype developers, and supervised industrial design of all housewares products for the $400 million division. He developed a modular construction concept for a drip coffeemaker line, and the concept of the Spacemaker under-cabinet appliances. After Black & Decker's acquisition of this GE Division, 1984-1985, he was manager of industrial design, Black & Decker Household Products. He was an active member of the American Society of Industrial Designers (ASID) from 1953, and after the merger in 1965, of IDSA. Active in the Southern New England Chapter of IDSA, he was IDSA National Secretary and was awarded Fellowship in IDSA in 1969. He holds several design and mechanical patents for major appliance and household products. He retired in 1985.